I was linked a website about the effect soursop has in fighting cancer. The website heavily implies that soursop is an effective cancer treatment similar to chemo. Chemotherapy is a widely known form of cancer treatment and is effective at destroying cancer cells however, as commonly known it may come with numerous side effects. One of those side effects that is more than likely inevitable is that of hair loss. This is because while chemo is destroying those harmful cancer cells in the body it is also causing harm to the normal healthy cells. As prior mentioned, this does not occur with soursop. The soursop kills damaged cells, and ONLY the damaged cells leaving the body immune to most of the side effects associated with chemotherapy. Some may also go as far as saying that soursop is "10,000 times stronger than chemo", but there are no cold hard facts behind this claim. What is factual and proven through scientific study is that the soursop, with its annonaceous acetogenins is more effective in targeting the cells that cancer patients want to target ie the cancer cells. Soursop is an effective cancer treatment. Soursop prevents cancer from occuring in the first place. Soursop targets cancer cells leaving regular cells unharmed. Does the research show that these are credible claims, since the page is saying there's been much research published on this, since the 70's? A search in the Pubmed database for "soursop cancer" (which is automatically expanded to ("annona"[MeSH Terms] OR "annona"[All Fields] OR "soursop"[All Fields]) AND ("neoplasms"[MeSH Terms] OR "neoplasms"[All Fields] OR "cancer"[All Fields]), so it will not only show exact matches) shows 43 results, though none of those are trials in humans. Graviola demonstrated anticancer effects in vitro, but has not been studied in humans. Despite the lack of human data, many websites promote graviola to cancer patients based on traditional use and on the in vitro studies. Caution is required as there is no evidence of safety or efficacy. There are several in vitro studies, but no human studies seem to have been performed. The result of such studies can't just be transferred to humans, you have to actually perform some clinical studies. The in vitro studies show that it has some potential as an anti-cancer drug, but that is a far shot from being proven effective in actually being safe and effective against cancer in humans. There is also some data that the annonacin in graviola can cause an atypical Parkinson disease (1, 2, 3, 4, 5). With the possible danger of causing atypical Parkinson and no evidence that soursop is actually effective against cancer in humans, I would strongly recommend to avoid it. Research carried out in the Caribbean has suggested a connection between consumption of soursop and atypical forms of Parkinson's disease due to the very high concentration of annonacin. 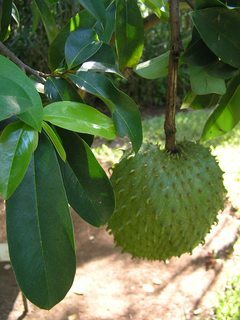 According to Cancer Research UK, Annona muricata is an active principle in an unlicensed herbal remedy marketed under the brand name Triamazon. Triamazon is not licensed for medicinal use and the sale of the product resulted in a conviction on four counts of selling unlicensed medical products, and other charges, for a vendor in the United Kingdom. In laboratory studies, graviola [a.k.a. Soursop] extracts can kill some types of liver and breast cancer cells that are resistant to particular chemotherapy drugs. But there haven’t been any large scale studies in humans. So we don't know yet whether it can work as a cancer treatment or not. Not the answer you're looking for? Browse other questions tagged medical-science cancer natural-remedies medications herbalism . What is the relationship between Chirimoya fruit and cancer? Is hypnotherapy an effective treatment for addiction, anxiety, phobias and other psychological disorders? Is the hydrogen peroxide therapy harmful? Does chemotherapy make cancer worse? Is marijuana an effective medicine for any one of these medical conditions? Does Artemisia annua kill 98% of cancer cells in 16 hours? Did Richard Nixon commission a study on the effects of THC and then have the results classified? Can scorpion venom be used to help to identify cancer cells? Is Turmeric better than prozac to treat depression?